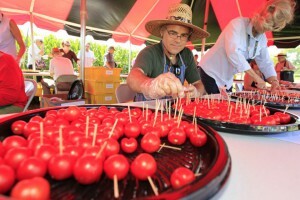 Attendees tasted more than 60 heirloom and hybrid varieties of beefsteak, plum, cherry and grape tomatoes at the annual Great Tomato Tasting held at Rutgers’ Snyder Research and Extension Farm, located in Pittstown, New Jersey. Since the mid-19th century, the state’s public land-grant university has emerged as a world leader in developing plants that sustain farmers, resist disease, and preserve heirloom varieties. And that’s just for starters. They also taste better, feed more people, require fewer chemicals, and even have the potential to power a truck. And it continues to accomplish it all on a shrinking budget.